Review date: 26 August 2003. If you've been keeping up with the world of pocketable gadgets, you'll have an idea what the Famous Technology Twin-TV is. It's a CompactFlash-to-hard-disk device - one of those "digital wallet" things, right? Yes, it is. But there's more. Digital wallets are portable devices that let you dump digital camera images - well, any data, actually - from memory cards to a 2.5 inch laptop hard drive. This means you only have to spend seven dollars (Australian) per gigabyte for your bulk storage, rather than the $AU500 or so per gig that Flash memory cards cost at the moment. Memory cards aren't nearly as expensive as they used to be, and 2.5 inch laptop drives are much more expensive per gigabyte than 3.5 inch desktop drives, but that difference is still very large. If you need a lot of image storage space, there's no contest. Get a couple of reasonably large memory cards and a digital wallet, and you can do non-stop shooting with your digicam. Just use one card while the other one's contents are copied to the wallet-drive. When you get back home, hook the wallet up to your PC (usually via USB), and it'll appear as a normal removable drive, from which you can grab the image files. Simple. The Twin-TV is a neat little unit. It's got a shiny frosted aluminium casing that's only 137 by 73 by 16 millimetres in size (5.4 by 2.9 by 0.6 inches), and it only weighs about 195 grams (6.9 ounces), including a drive. ...more connectors than the average digital wallet provides. 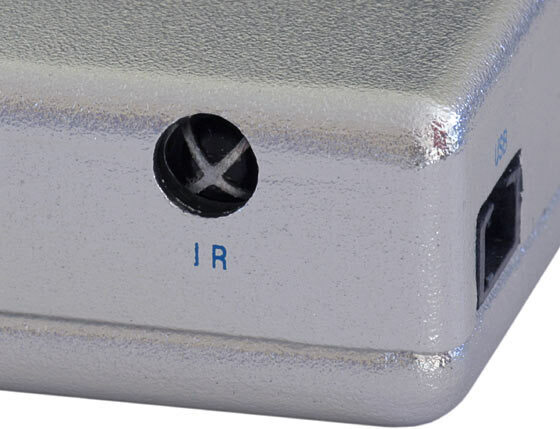 There are two power inputs, one for 12V and one for 5V. There's also a power switch and a mini-USB socket. More important, though, is the micro-jack connector in the middle, which accepts a three-RCA-plug A/V cable. 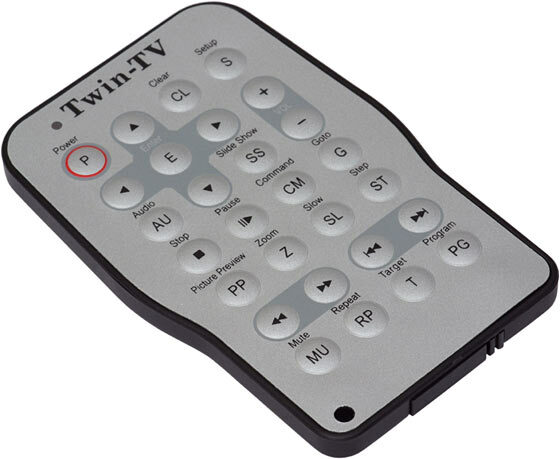 The Twin-TV has composite video and stereo audio output, and can play MPEG video files, MP3 audio files, display pictures (as a slideshow, if you like, with multiple different wipes, nine-up image preview, and optional MP3 background music), and even play PowerPoint presentations. That last feature isn't much of a one, though, since all it actually means is that you can display a static slideshow presentation that's been saved as a series of JPEGs. But the rest of the stuff is cool. It's just as well, too, because the Twin-TV isn't a very exciting digital wallet. I recently reviewed the Vosonic XS-Drive II. It's a quite highly evolved digital wallet, and it's better at what it does than the Twin-TV. 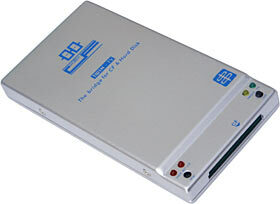 The Twin-TV does more, but if you just want a digital wallet, you want the XS-Drive II. The two gadgets cost exactly the same, but the Twin-TV has only a CompactFlash card slot (which accepts both Type I and the thicker Type II cards). 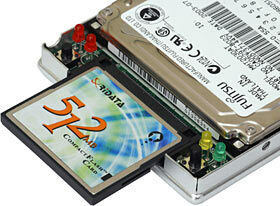 The XS-Drive accepts multiple card formats. The Twin-TV also has no internal batteries, though it comes with an external battery pack for on-the-road use. The XS-Drive has a decent-capacity lithium ion battery built in. This makes the XS-Drive rather bigger than the Twin-TV, but nothing dangles. The XS-Drive also works as a USB 2.0 memory card reader/writer, as well as letting you access its internal hard drive over USB. The Twin-TV doesn't do that. Its hard drive is all that a computer can see over USB. No drive shows up at all if the Twin-TV's connected via USB with a card in its slot. The XS-Drive II and TwinTV each, as I write this, cost exactly $AU209 delivered from Aus PC Market, plus the price of whatever hard drive you choose to put in them. An XS-Drive II with a 40Gb drive pre-installed is $AU485.10 delivered; a TwinTV with pre-installed 30Gb drive is $AU412.50. Here's the Twin-TV kitted out with one more cable than you need for mobile video or audio playing. It's got its battery pack connected, and its A/V lead, and its USB lead as well, just to show you what that looks like. 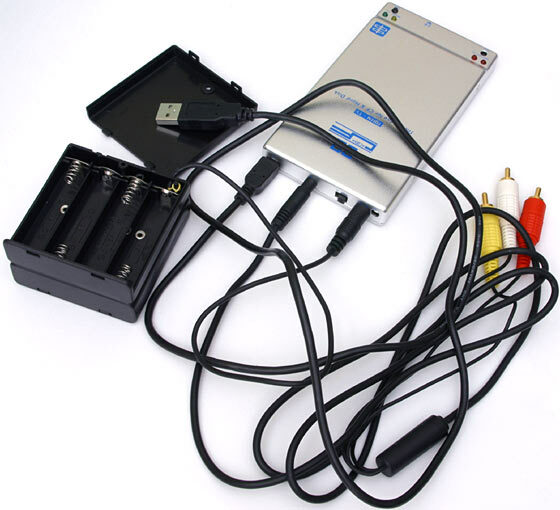 The battery pack is a AA-cell holder; it takes eight AAs, four on each side. There's a cover for each side, so the batteries aren't just sitting out there in the breeze, but it'd still be easy enough for the barrel-plug cable to get yanked out if you used it carelessly. The Twin-TV also comes with this multi-voltage AC adapter, good for 100 to 240 volt input at 50 or 60Hz, and equipped with an American-style two-parallel-pins plug. 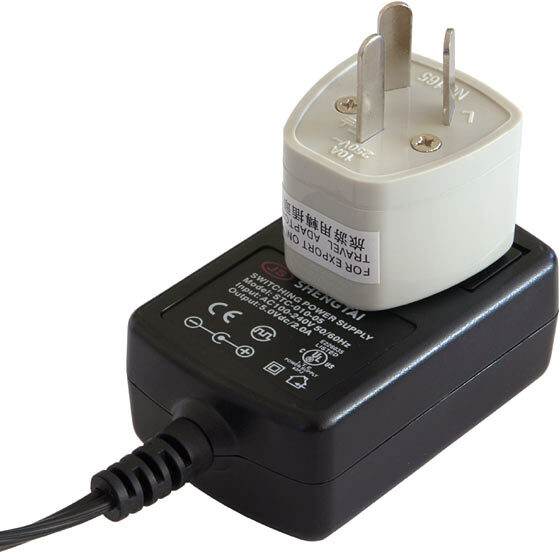 The Australian-issue Twin-TV gives you a pin-adapter to suit our style of socket; invest in another adapter or three and you'll be ready to travel the world. ...provided, of course, that the remote receiver on the side of the unit was pointed the right way. 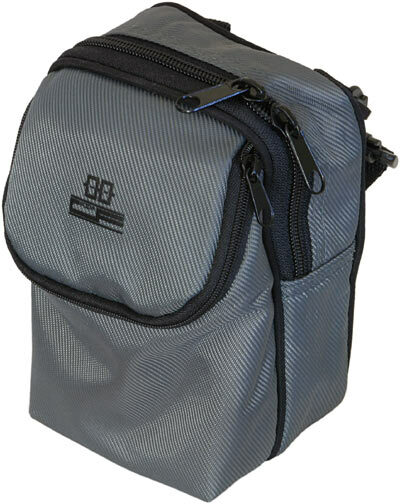 You also get this neat carry bag with the TwinTV. It's got a shoulder strap and a belt loop. With a bit of cable-stuffing skill, you can fit the TwinTV, all of its cables, its battery pack, its remote and its AC adapter in there. The Twin-TV's casing is held together by four countersunk screws; it's easy to get it apart, and quite easy to install a hard drive. You get a weeny little screwdriver and some drive mounting screws with the Twin-TV. The slim Twin-TV casing has no room for shock absorbers, and the manual warns you not to drop it. Laptop drives are built to cope with rougher treatment than desktop units, but you shouldn't press your luck. I thought it'd look more interesting if I took the lid off before taking my card-inserted picture. As a digital wallet, the Twin-TV takes a moment to get used to. As with all such gizmos, you plug in your card, press a button, then wait for your data to make it from card to hard drive. In this case the button's rather small, but it does the job. The problem is the feedback you get during the copy operation - there isn't much. 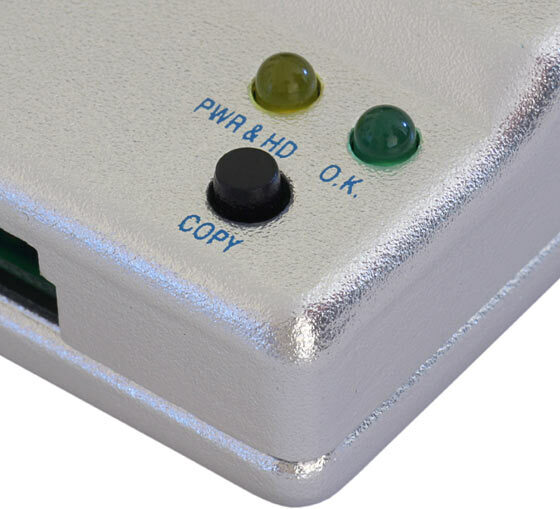 The hard drive light flickers, and at the end of the copy the OK light turns on, but there's no beeper or little LCD progress screen, and copy operations can take a while. Like the XS-Drive II, the Twin-TV is disappointingly slow to copy data from a memory card. For copies of only a few megabytes, it manages little more than a quarter of a megabyte per second overall; for large copy operations involving big files, it tops out at around 400 kilobytes per second. This is a bit of a problem, if you expect to regularly shift lots of data to the TwinTV from CompactFlash. If you've only got a 64Mb memory card for your camera, I doubt you're going to be buying a digital wallet; these things are for people who expect to be squirting at least 100Mb data blocks over on a regular basis. Quite possibly a lot more, since 1Gb CompactFlash cards are now quite mainstream items among serious digital photographers. At 400 kilobytes per second, every hundred megabytes will take about four and a quarter minutes to shift. The slow copying presents another problem. If you lose power during the copy operation, or if you just lose faith and yank the card or turn the Twin-TV off because you think the operation's failed, you'll end up with an error on the disk. I aborted a few copy operations in various ways myself, just to see how bad an error I could create. It turned out to be no big deal; I managed to create some nonsense-named files that were A-OK as far as Windows error checking was concerned, but couldn't be deleted. Reformatting the drive will zap those, and that was as bad as it got. The Twin-TV manual seems to say that you can only copy JPEG, MP3, MPEG-1 and MPEG-2 files from card to drive (the documentation's English is mildly mangled, so maybe that's not what it means), but the Twin-TV copied every file I threw at it. It can only do anything with the aforementioned file types, but it'll copy and store other types with no trouble. Fortunately, the Twin-TV's USB speed is fine. Like the XS-Drive, it's a proper USB 2.0 device (also like the XS-Drive, it can't be powered by the USB lead), and I found its read and write speed for large files to be better than 12 megabytes per second, and better than 10 megabytes per second, respectively. So you may have to wait more than 21 minutes for 500 megabytes of data to copy from a card to the drive, but you'll be able to shift that data onto a USB 2.0-equipped computer in a scant 40 seconds. It also won't take long to stock the Twin-TV with lots of audio and video data from your PC. Connecting the Twin-TV to any video gizmo is easy, thanks to the simple three-RCA-plug cable. If you've bought a cheap DVD player lately, you may find the Twin-TV's user interface (disregarding the background landscape) strangely familiar. Yes, its optional screen saver is the classic bouncing, colour-changing "DVD Video" oval. The interface isn't a usability masterpiece, but it does the job, and the menu structure isn't horribly obscure. Which is good, because the various audio and video options (slide show modes, different audio mixdown settings, soundtrack selection for multi-track DVD rip playback, PAL/NTSC selection...) aren't mentioned at all in the manual. The manual's in Adobe Acrobat format on the software CD. It covers setup and basic operation well, but that's where it stops. You also get a multilingual quick-start guide on paper, but that's only a pamphlet. The software CD contains drivers for Windows 98, Mac OS 9 and Mac OS X. Windows ME, 2000 and XP recognise the Twin-TV natively, as a USB Mass Storage Device. 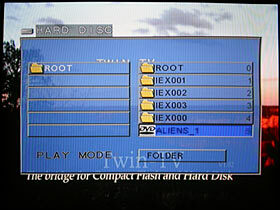 If you put a memory card in the Twin-TV while it's connected to a TV, you'll see a directory listing for that card (you can also switch back to the hard drive listing at will). The copy button works as normal now, and you get a running display of the copy status on the TV screen (it's not quite right, showing the name of one file and the size of another, but it's good enough). You can also copy files around on the hard drive itself, if the urge strikes you, but doing that using the remote control isn't very easy. You don't have to copy anything, though; you can do anything with files on a memory card that you can do with files on the Twin-TV's hard drive. So you can just pop in the memory card from your camera and run a slideshow, or the memory card from your MP3 player and play some tunes, without waiting for a copy operation. The Twin-TV understands plain and progressive JPEGs, but it for some reason takes a lot longer to display progressive images. It displays the minimum resolution version, then pauses for a second or three, then displays the medium resolution version, then pauses again, then displays the full resolution version. Most people will never ask it to display a progressive image, though. The Twin-TV's big feature is its ability to play movie files. It can only play MPEG-1 and MPEG-2 files, so it's not a general purpose downloaded-movies-on-your-TV solution. But if you take this big limitation into account, it works well. I bounced a selection of MPEG-1 files in different resolutions off the Twin-TV, and almost all of them worked. The only non-broken file it didn't like was the 240 by 176 pixel version of a certain well-known short film, which played, but was offset right and down, with some of the image lost off the edge of the screen. Video CD files played, too. The Twin-TV had a problem with one of my test MPEG-1s, playing the sound and video out of sync. But Virtual Dub reported that the file contained a couple of "anachronistic or discontinuous timestamps". Error-free files were better behaved. As with all of the current generation of MP3-playing devices, the Twin-TV is perfectly happy with all sorts of different constant and variable MP3 bit rates, and I also found that it had no problems with various different MP2 audio tracks on video files. MPEG-2 files worked as well. The 720 by 540 pixel MPEG-2 version of Bats and his alien friends played without a hitch. And yes, so did ripped DVD VOB files; you just need to DeCSS them with the software of your choice, and away you go, playing them as you would on a PC. You only get stereo audio and composite video, of course, and you can forget about menus and such, but it'll do for most purposes. For a certain niche market, the Twin-TV's DVD-file playback abilities are likely to be really handy. If you've got the energy to rip the VOBs and copy them, you'll be able to fit the video from several DVDs onto a Twin-TV with a decent-sized drive in it. I leave it to you to figure out whether this is something you actually want to do. The Twin-TV's playback control isn't as good as a DVD player's, mainly because of its awkward little remote, which makes it easy to accidentally quit to the main menu in the middle of a movie. Its fast-forward is jerky, too. But the thing fits in your pocket, so it doesn't do to complain. If you want a device that can play your cherished complete downloaded collection of sci-fi that never showed in your country, banned Bugs Bunny cartoons or what have you, the Twin-TV will not be very useful, because all of that stuff probably isn't going to be in MPEG-anything format. It'll be AVIs or MOVs. "AVI" and "MOV" are not simple standards. They're wrapper formats for video and/or audio that can be encoded in various different ways. As anyone who's dealt with computer movie files for a while will know, there are umpteen different audio and video codecs used for PC and Mac video, and the more popular video codecs are frequently updated. This is a big pain for makers of standalone video player gadgets. Even if you make a device with user-updatable software/firmware that can accommodate new and updated codecs (for which you'd need quite a bit of storage...), you then find you need a general-purpose processor to run all of them. Say hello to high component count, high unit price, and high power consumption. If you want to play non-MPEG video on the Twin-TV, you'll have to convert it to MPEG. Since you're only ending up with composite video output, Video CD quality will be adequate and keep file sizes down; VCD is also a well-recognised format that various converters support. You'll lose quality, of course, but it's amazing how composite smooths over awfulness. It does wonders for VHS. Using video converters is about as much fun as this sort of thing always is, of course. Intermediate Virtual Dub use to uncompress the audio track because your converter doesn't understand non-PCM sound. Maybe uncompressing the video too (Woo! Huge file!) to get around converters that don't work right with the DivX or XviD codec variants that a lot of PC video files currently use. It's all the fun of the fair. Frankly, I wouldn't bother with this, except maybe now and then when you want to take that hilarious AVI you just downloaded with you to the party. Even then, if the party-throwers have a modern DVD player, it can probably play VCDs and Super VCDs; if you're doing the conversion anyway and you've got a CD burner, you might as well just make a video disc. The Twin-TV's AC adapter is a five volt unit; it's odd that the Twin-TV also runs from 12-ish volts from its battery pack, but it's good news for people interested in running it in their car or boat or solar powered yurt. I tested the Twin-TV's current consumption from 9.6 volts, which is what it'll get from eight AA NiCd or NiMH rechargeables, and also from 12 volts. Pleasingly, current draw fell as voltage rose; this is the sign of a well-engineered power supply that won't go bananas at unusually high or low voltages. I'd still be mildly nervous about plugging a Twin-TV into a cigarette lighter socket when the vehicle's engine was running, since automotive alternators output 13.8 volts and the electrical system can spike when you turn things on and off, but it'd probably be OK even then. When the Twin-TV's drive wasn't spinning (it's got a very short spin-down timer, to save power) the 9.6 and 12 volt current draw was about 430 and 350 milliamps, respectively. With the drive spinning, the draw rose to about 570 and 470mA. That's around 4.15 watts with no drive activity and around 5.5 watts with the drive working. It's a not-too-awful load for AA alkalines, and a quite gentle load for AA rechargeables. From alkalines or rechargeables, you'd get three to four hours of continuous drive-spinning time, easily. You could even get an hour or two of service out of a set of carbon-zinc AAs, if you had to. 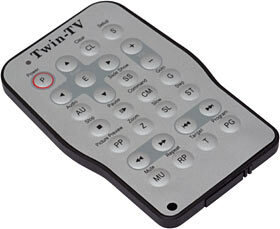 The Twin-TV is an interesting gadget, which some people will find very useful. It's a USB 2.0 hard drive, it's a passable digital wallet, it's an MPEG and MP3 player with JPEG display and slideshow capabilities, it looks and feels quite good, it's got a decent remote, and it's not awfully expensive. DVD players that can handle at least some DivX-compressed AVIs are now available; it shouldn't be too long before that technology makes it to a Twin-TV-ish device. We'll be waiting a lot longer for a portable player that can handle all of the various AVI and MOV codecs, though. Maybe forever, or until everything collapses into one codec. If its limitations don't bother you, the Twin-TV is a fine product. Recommended. Aus PC Market don't sell the Twin-TV any more; this cheaper player's the equivalent. Aus PC's list of 2.5 inch drives is here. The Twin-TV's made by one of those companies that expects other people to rebadge their products. For this reason, you won't find a makers name on the gadget, its packaging or its documentation. The actual manufacturers alternate between calling themselves Magic-Pro and Famous Technology. The Twin-TV also doesn't seem to have a product page of its own yet. It's mentioned on this news page, but that seems to be it. 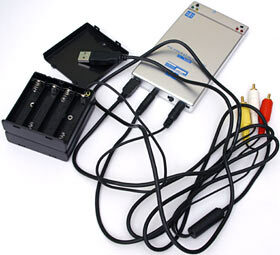 I could be wrong, mind you, since Magic Famous Pro Technology site's whimsical navigation system wants you to click on a picture of a power supply to view "multimedia" products, and then shows you two USB flash drives.